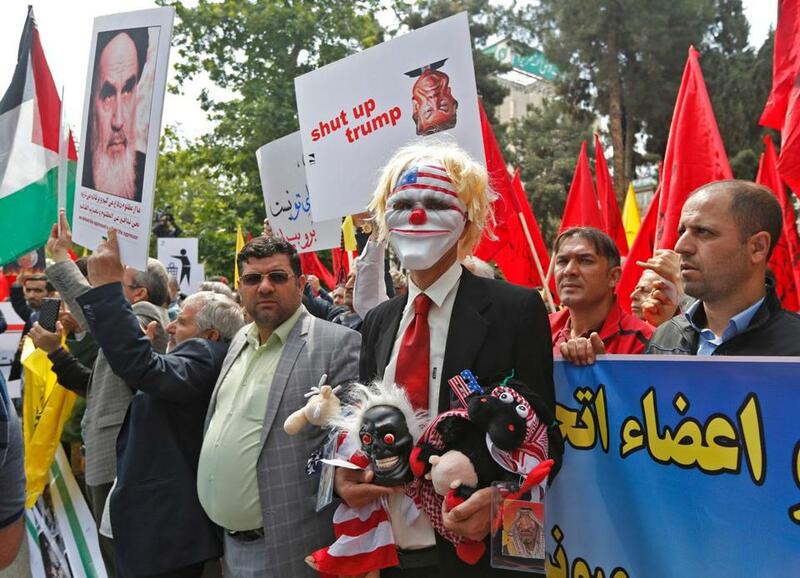 Iranians take part in an anti-US demonstration inside the former US Embassy headquarters in the capital city of Tehran on May 16. This past week, I asked 450 voters to rate — on a scale of 1 (for dissatisfied) to 10 (approval) — President Trump’s decision to pull out of the Iran agreement. Although there is common ground in America on issues like gun control, DACA, and infrastructure, voters are very divided on America’s exit from this deal, otherwise known as the Joint Comprehensive Plan of Action, or JCPOA. Did the Iran agreement make us safer, or not? Two readers write with opposing views about President Trump ending the Iran agreement. It’s a stunning example of polarization in the views of Americans. (1) Whether we got enough in return for lifting hundreds of billions of dollars in sanctions. To Trump supporters, we were focused too narrowly on nuclear capabilities, with no regard to ballistic missiles or the use of the money, which, they have read, is funneled to terrorist activities in Syria and Yemen. And, “The deal took all future nonmilitary options off the table.” To nonsupporters of Trump’s action, it was an imperfect deal, supported by our allies, that was working successfully as a deterrent. (3) Whether they trust that Trump made this decision with extensive thought, input, and conversation with allies. The anti-Trumpers believe that this was a rash campaign promise, made by an uninformed president who will reject anything done by Obama. The supporters of the agreement see the president meeting with international allies, consulting with his team, and accessing much more intelligence than we have. If there is any common ground at all in the minds of voters, it’s the ephemeral nature of executive power. Any deal done without the approval of Congress just might be a deal without teeth, and voters are wondering whether Trump will strike a North Korean agreement on his own without ultimately reaching out to lawmakers for their blessing. And few are surprised about the decision. After all, this is a president who does what he says he’s going to do — even when those promises are alarming. Diane Hessan is an entrepreneur, author, and chair of C Space. She has been in conversation with 450 voters across the political spectrum weekly since December 2016. Follow her on Twitter @DianeHessan.